Perfect for both nautical and cabin style decorating. This project has four shelves so you can add your own decorative touch. Project can also be built without lamp and used as a wall shelf. Order lamp hardware and 1/8" plywood separately. 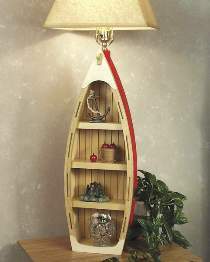 Boat itself measures 23"H x 8-1/4"W x 5-1/2"D. Boat Shelf Lamp Hardware Parts Package includes push-thru socket, 8 foot clear cord set, lamp harp and miscellaneous lamp hardware. Project plan, light bulb, wood and wood finish not included.